San Francisco is my favorite American city. It was where I spent the day for my 13th birthday, where my husband and I shared our first weekend together, and where I went to college (Go USF Dons! 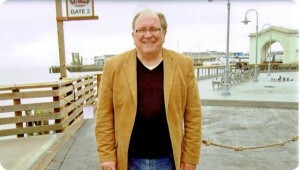 ), so when I was offered the opportunity to read/review a noir mystery set in the City by the Bay, I had to say yes. 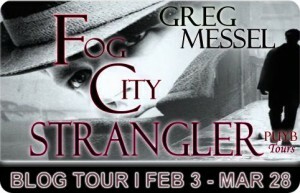 Fog City Strangler did not disappoint. From the first scene, where Amelia is trapped between fire and an unknown assailant in her Stinson Beach beachhouse to the very last page, the story was gripping and action-packed. Sam Slater is a fantastic character, and while his exploits are new to me, I’m hooked enough to want to read the other books he inhabits. Author Messel does a great job of making a period piece seem neither campy nor outdated, and making his stories relevant for a contemporary audience. 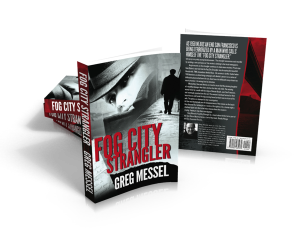 In short, Fog City Strangler is the perfect book to curl up with on a rainy day. Just make sure that you keep the windows closed and the doors locked while you read. Goes Well with Cioppino and Anchor Steam beer. •	One winner will be chosen via Rafflecopter to receive the 3 book set and $25 Amazon Gift Card. •	This giveaway begins February 3 and ends on March 28. •	Winner will be contacted via email on Monday, March 31, 2014.